Treat your near and dear ones in an exclusive way with this Magnetic Bunch of 10Pcs Mixed Carnations and make them feel very special. 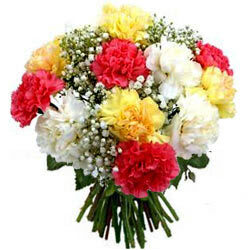 This voluptuous Combination of Mixed Carnations and Chrysanthemums are eye-catching to look at. Flowers Delivery Guwahati, Send sweets Kasargode, Wedding Cake Dholpur, Diwali Mithai Navsari, Send Flowers and Gifts to Navsari, Online Shop Siwan, Flower to Kottayam, New Year Flowers Devangere , Fresh Fruits Valsad, Send Gift Saharanpur, Dry Fruits to Zirakpur, Birthday Delivery Karauli, Sending to Jaisalmer, Flower shop Coimbatore, Karauli Online Cake Delivery.